"The Boston Coliseum, or Temple Of Peace, was a temporary building constructed solely for the purpose of hosting the National Peace Jubilee in 1869. This enormous structure stood where Trinity Church and the Copley Plaza Hotel are now located in Copley Square. 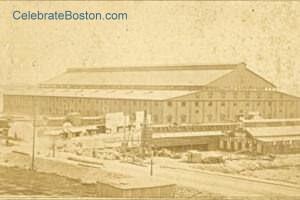 The Coliseum was built upon the Back Bay land at the crossing of the railroad tracks. The original plan of a truss roof, unsupported by pillars, was changed in consequence of damage by the gale of the 26th of April in 1869. The only truss that was successfully raised measured 340 feet across and was 130 feet high. The building was 550 feet long by 350 feet wide, covering about 4-1/2 acres. The main walls were 40 feet high, resting upon a substantial foundation of piles, and the height of the central point of the roof was 120 feet. The towers at the ends each stood 25 feet above the roof. The seats for the chorus occupied the easterly end extending forward 240 feet from the end, arranged as an amphitheater rising some 25 feet. The parquet was 235 feet long by 200 in width, surrounded upon three sides by promenades 25 feet wide under the galleries. These galleries were 75 feet deep, being 10 feet from the parquet in front and rising backwards to the wall. Entrance was had by 12 doorways, each 25 feet wide, and access to the galleries was via 12 broad stairways leading directly from the outside doors. The Organ was built by J.H. Wilcox & Co. and was purportedly the most powerful instrument ever constructed until then. It was without a case and fills a space 30 feet wide by 20 feet deep. It contains 1786 pipes, the larges being 43 feet high. It was supplied by wind from 8 pumps worked by a gas engine. The Chorus numbered about 20,000, from all parts of the Union. The Orchestra was purportedly the largest ever gathered until then, numbering about 2,000 musicians, from parts of the country as well as England, Ireland, France, and Germany. The Big Drum was 12 feet in diameter and 6 feet wide, and elaborately decorated by Lyford & Boyce. More than 3,000,000 of lumber, 40 tons of nails, bolts, bars, braces, etc., were required in the construction of the Boston Coliseum. The Grand Reception Room was at the left of the main southern entrance, beautifully frescoed, while the wainscoting was finished with panels of black walnut. The Press and Telegraph Rooms were at the right of the same entrance, and were furnished with all desirable accommodations for the members of the press, while the telegraphic facilities were ample for communicating with all parts of the world. The architect was William G. Preston. It was planned to demolish the Coliseum structure on or before November 1, 1869. A huge gale blew off part of the roof in late 1869, and the building was demolished after that [part of this structure was probably used in the construction of a new Coliseum for the later music jubilee in 1872]."